When Switch started in 2005, the premise was to inspire women and girls to work with technology and give a voice to those who are changing the way we live, work, and play through unique products and projects with a female focus. Most of the pieces have focused on my love of fashion technology, a.k.a. "wearable technology." Now, in 2014, you can hardly go a day without a new wearable device popping up on your mobile newsfeed. It's the hottest trend in tech and it's buzzing everywhere from Silicon Valley to Paris, from Intel to Ralph Lauren. While all the "buzz" was going on, I started a fashion technology company, Switch Embassy. I’ve been deep in the throes of the daily entrepreneurial grind. I let iHeartswitch.com take a backseat and pitching investors or potential clients take over my attention. I have learned so much and it has been somewhat unsatisfying without you, Switch Reader. What's the point of learning all these amazing things and going through the work and hardship, if I can't share it with others who can learn from it? In my race to make the best company and innovative products, I gave up the thing that I love. 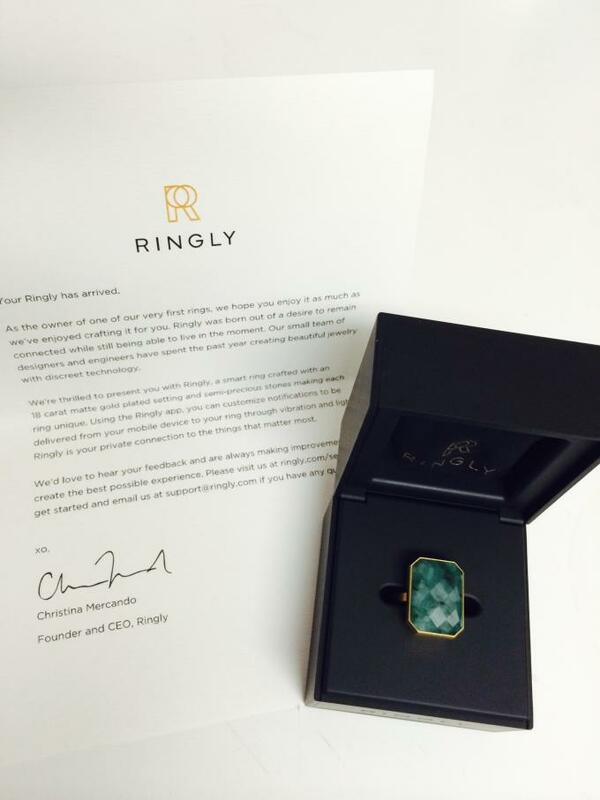 I had forgotten that my work had any influence and felt lost in the deluge of all the other wearable excitement. For this, I apologize. I was reminded of my passion to share a number of times, over the past two years. It wasn't until a young woman named Thea Koullias, from Jonlou, approached me at Wearable World and said to the man I was talking to, "Don't know you know who this is? Alison, I've read all your blogs and watched your videos! You're one of the reasons you got into this [fashion technology]." Today, I hope you will welcome back spontanous blog posts from iheartswitch.com. On top of the wearable technology and passion projects, I will share the ups and downs of starting a company as a “designy" woman in a very "techy," male-dominated world. 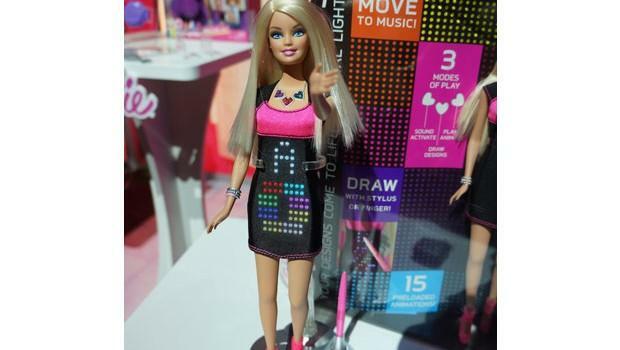 The Barbie Digital Dress Doll hit the New York Toy Fair last week and my inbox and Facebook went wild with excitement and sharing. The dress is black with the latest touch-screen technology that allows girls to create and select their own animated digital designs to appear on her dress. 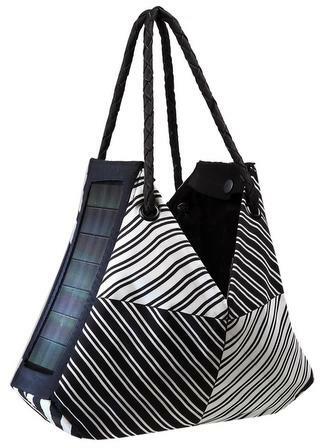 I was searching through my favorite fashion technology blogs and found some designer solar bags way back in 2010. Elle Magazine teamed up with designers such as Tommy Hilfiger, Rogan, Loomstate, and Vena Cava to create ELLE/Portable Light Project bags. The bags are to were auctioned off on Ebay to support the Portable Light Project. Most looked amazing, some were just technology stuck to an old bag design, like DVF. My favorite is the one above by Rogan. The thing about fashion and technology is that it isn't about the technology at all. It is about sharing, augmenting, and expressing who we are as human beings. Technology is a tool, albeit sometimes a powerful tool, but it is not a replacement for what is in our hearts and what we desire. So when Diane Von Furstenberg put Google Glasses on her team and models this year, this was something I had to see. I'll be the first to admit, I was skeptical seeing Google Glass on the runway. The glasses look frumpy and cold. But, a look past the ugly frames of technology and you can find inspiration. Watch below. ‎"When I was younger, I didn't know what I wanted to do, except the woman I wanted to be. I wanted to be on the go, and to be able to pay my own bills and I so much wanted to be independent. My goal in life is to tell every girl, every woman, that they can be the woman they want to be" - Diana Von Furstenberg. The only designers that impact our sensabilities as a culture try something totally new, work with unique materials, and challenge our idea of fashion and wearability. Paco Rabanne is one such designer. In 1969, the same year as the Moon Landing, he presented the world with a haute couture collection made up of metal and plastics (seen above). I am impressed by the video and find it reminencent of the kinds of designs that we find today with Iris Van Herpen and Hussein Chalayan.